How Does He Help You: He provides support for Estimators. Greg creates quotes for large remodeling projects. I have been working in the construction industry since I was 15. After spending 4 years at Rutgers University obtaining an engineering degree and another 4 years working as an engineer, I decided to come back to what I always enjoyed most. I started at Monk’s Home Improvements shortly after it opened as Monk’s Painting. Having known Ty Monk for many years before working with him, the decision to join the company was an easy one. I have seen and helped the company grow from the painting company it started as to the renovation and home improvement company it is today. As a home owner myself, I fully understand the challenges that come along with owning a home. I pride myself on informing my customers about the best way to maintain and improve their homes. I find it is best to work with an informed consumer who has been told of all the available options before venturing into a project. Therefore, customers get a great quality product that best suits their needs and budget. My previous home was located in downtown Morristown. In 2013, I fully renovated the kitchen. You can even see the entire project documented here. 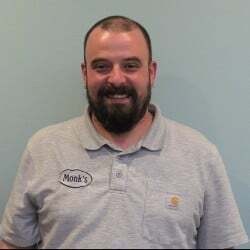 Greg Kihm now lives west of Morristown with his wife who is also a Monk’s employee!